Coming straight off Square-Enix's Twitter account comes pleasing news concerning the release date for Lightning Returns' debut trailer. As of now only tidbits of information can be found about the heavily anticipated and controversial sequel to Final Fantasy XIII-2, but on December 22nd that will change as Square-Enix will dispel anxiety and buff up Final Fantasy fans with a spell of excitiga! 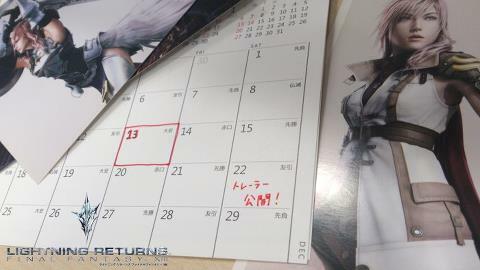 Aside from the picture posted on Square-Enix's Twitter account, there is no other verifiable information concerning the upcoming installment in the Final Fantasy reperptoire, but do mark your calendars because Lightning Return's trailer will be quite the treat! In case you haven't noticed, I am beyond enthralled to hear about this trailer and will definitely be viewing the trailer more than once when it arrives.